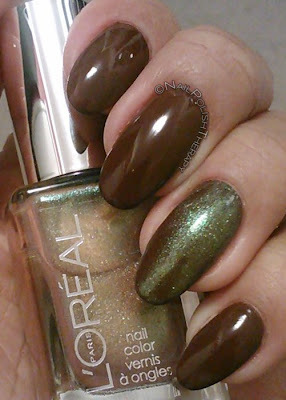 Loreal Downtown Chic and The Temptress Power, While walking with my husband and our dogs to the local Walgreens to get a Redbox, I was lucky enough to catch a great sale on Loreal polishes. I think at the time it was a BOGO or a buy one get one free and I went to town. I got Downtown Chic and The Temptress' Power among many others I hauled that night. 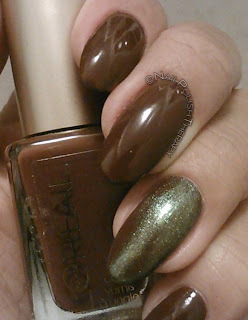 Downtown Chic is a creme chocolate brown. Great formula and easily covered in 2 coats. I added The Temptress' Power thinking it was going to be a very subtle accept to the brown but it changed the look of Downtown Chic completely. I should have taken a video of this because this combination looked like oil slick to me. 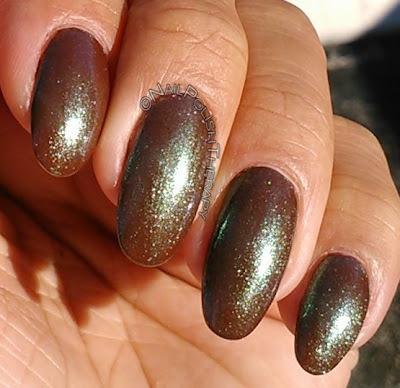 The Temptress' Power is a caramel based thin polish with emerald green shimmer that almost has a holo look. It can be considered a "topper" to enhance any other color but on it's own just as pretty. The green was prominent on the brown Downtown Chic so it didn't have the subtle effect I wanted but it was cool nonetheless so I left it on for a few days.